Monthly Print Volume A high monthly copy volume is up to 210,000 for monochrome and 105,000 for color printing. Toner yields are 33,600 CMY and 38,400 K (at 5 percent) respectively. Drawer 2: 550 Sheets-ST-R to 12" x 18"
Toshiba e-Studio 3015AC Multifunction Color Laser Photocopier is made in china and its country of origin is Japan. It is built 1200 x 1200dpi printing resolution.You can use this photocopier in multiple purpose , like - Print, Copy, Scan and Fax. This photocopier capable for Max.90K Month (Color: 100%), 180K Month (Monochrome: 100%) duty cycle with 584.2 x 640.08 x 787.4mm dimensions.The Indirect Electrostatic Photographic Method/OPC/Laser Printing/Heat Roller Fusing copy process is used in this photocopier with 4GB (RAM), 320GB (Hard disk) memory. In this Multifunction Laser photocopier,First Page Copy Speed is 5.9 Sec (B), 7.8sec (C), Copy Speed is 30ppm, scan speed is 120ipm (Simplex), 240ipm (Duplex) in color, black and white scan ,print speed is 30ppm, approx. 3 seconds per page transmission speed and Up to 33.6 Kbps fax modem speed. This multifunctional photocopier has 600 x 600dpi scan resolution with 9" Color WVGA Touch Screen Tilting Display with Warm-Up Time is approx. 20 seconds. 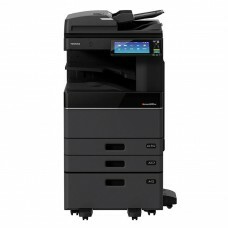 Toshiba e-Studio Photocopier is built in USB, LAN, Wi-Fi and Bluetooth with 1200 Sheets standard and 3200 Sheets maximum input paper capacity.The Toshiba 3515AC Series can increase the efficiency of your workgroups, improve the professionalism of your presentations, and streamline the workflow of your organization. And, that’s just for starters.This exclusive photocopier's high monthly copy volume is up to 210,000 for monochrome and 105,000 for color printing. Toner yields are 33,600 CMY and 38,400 K ( at 5 percent) respectively. This Color Laser Photocopier provides 01 year of warranty.